In the screenshot below ‘Spanish’ language has been enabled. Note: This action can take time depending on the number of languages selected and is ideally recommended to be performed during non-peak hours. 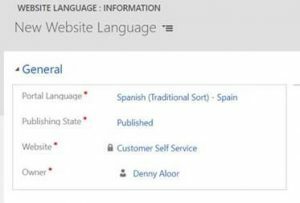 2) Within your Dynamics CRM instance go to Portals -> Websites and open the required website record which needs to be enabled for multi-language. 3) Click on the ‘+’ button next to the ‘Supported Languages’ sub-grid to add a new ‘Website Language’ record. 4) On the ‘Website Language’ form set the below fields and save the record. 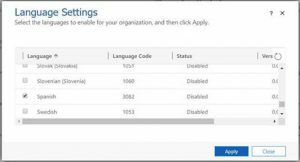 Note: This action would automatically generate new records (related to newly provisioned language) for all the language enabled OOB Portal records, however, it won’t have the translated values. The translation would need to be done manually. E.g. : There will now be 2 records for each ‘content snippet’ record. Open these records (related to the newly provisioned language) and update the values with the translated text. Do the same for all the other required entities. 5) The language menu should now be available on the Portal. Changing the language on the Portal would automatically refresh the portal with the translated values.